KABUL, Afghanistan (CNN) -- Afghan President Hamid Karzai said Sunday that his country would join the strategic review of the U.S.-led war on terrorism. 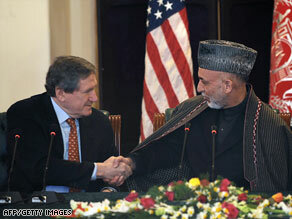 Afghanistan President Hamid Karzai, right, meets with Richard Holbrooke in Kabul on February 15, 2009. Speaking at a joint news conference with visiting U.S. diplomat Richard Holbrooke, Karzai said he is "very, very thankful" that President Barack Obama accepted his proposal to join the review. Holbrooke is visiting Afghanistan after a trip to neighboring Pakistan. Obama and Secretary of State Hillary Clinton tapped Holbrooke as special representative for the two countries, a signal of how the new administration considers Afghanistan and Pakistan intertwined in any solution to the war in Afghanistan and the terrorist threat along their shared border. At the news conference in Kabul, Holbrooke said Sunday that he conveyed the administration's support of the upcoming elections on August 20, a date recently set by Afghanistan's electoral commission. "President Obama and Secretary Clinton and the United States government were very gratified to hear President Karzai reaffirm his support of the August 20 decision," Holbrooke said. Holbrooke's visit comes as Obama plans to send another 30,000 troops to Afghanistan to fight what he's called the "central front in our enduring struggle against terrorism and extremism." In an interview on CNN's "Fareed Zakaria GPS," which aired Sunday, Karzai said that, with a resurgent Taliban, a still-flourishing drug trade and a border with Pakistan believed to be home base for al Qaeda, his country can't afford for U.S. troops to leave any time soon. "Then, the United States can leave and, at that time, the Afghan people will give them plenty of flowers and gratitude and send them safely back home." At the same time, Karzai said the actions of troops currently in Afghanistan have turned some of the public against them. "It's the question of civilian causalities. It's a question of risk of Afghans. It's the question of home searches," he said. "These activities are seriously undermining the confidence of the Afghan people in the joint struggle we have against terrorism and undermining their hopeful future. "We'll continue to be a friend. We'll continue to be an ally. But Afghanistan deserves respect and a better treatment." While he said he welcomes additional U.S. troops, Karzai suggested they need to work along the Afghan-Pakistan border and in the poppy fields that fuel a drug trade that threatens to turn the nation into a narco-state -- not in the villages where most Afghans live. "We have traveled many years on. What should have happened early on didn't unfortunately happen," Karzai said. "Now, the country is not in the same mood as it was in 2002. And so any addition of troops must have a purposeful objective that the Afghan people would agree with." The Obama administration is conducting several reviews of U.S. policy in Afghanistan, including a review by Gen. David Petraeus, the commander in the region. Defense Secretary Robert Gates has said the original mission in Afghanistan was "too broad" and needs to be more "realistic and focused" for the United States to succeed. "If we set ourselves the objective of creating some sort of central Asian Valhalla over there, we will lose, because nobody in the world has that kind of time, patience and money," Gates said during a recent Senate hearing. He called for concrete goals that can be reached in three to five years. Speaking via satellite from Kabul, Karzai called former President George Bush "a great person," but said he can work with Obama -- despite the president's comments as a candidate that Karzai had "not gotten out of the bunker" to improve security and infrastructure in Afghanistan. "President Obama is a great inspiration to the world," he said. "The people of America have proven that they can really be the light holders for change and the will of the people in the world. "And his coming to power by the vote of the American people is a manifestation of that great power of the American people." Karzai also acknowledged corruption in the Afghan government, but defended the work he's done to combat it. "Sure, corruption in the Afghan government is as much there as in any other third world country," he said. "Suddenly this country got so much money coming from the West, suddenly so many Afghans came from all over the world to participate. Suddenly there were projects -- suddenly there were this poverty that turned into some sort form of prosperity for this country," he said. He said a government department has been created to deal with corruption and that corrupt judges, administrators and other officials are dismissed "daily" over corruption charges.